Fetch the Feeling Cards are a set of different faces that depict a range of emotions. They are a great tool for facilitators, counselors, teachers, and psychologists to help students learn how to express, share, and understand their feelings. You will receive 44 cards in your packet. This will be two if each face card. 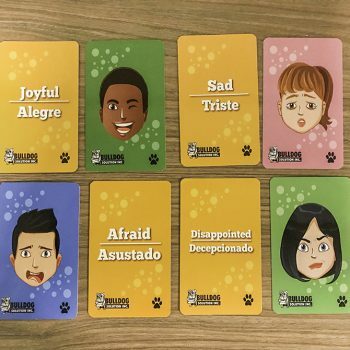 The following processing tool is a diverse activity that helps students share about their emotions and learn how to best manage their feelings in different situations. The cards can be used as an activity or a processing tool. The cards are meant to open up conversations about emotions. Students will explore their feelings, talk about their behaviors, and process thoughts associated with the different situations. A great way to start a discussion is to have your students choose a card at random. 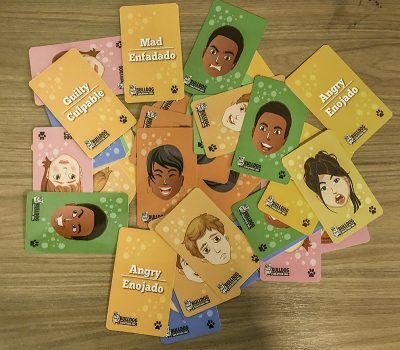 Once the participants have their card, they can talk about a time they had felt this emotion, what caused this emotion, and what action had taken place because of this emotion. This will help the participants learn about how important this emotion is and how it affects thinking and decision-making. Using the Behavioral Triangle can help students with the process of sharing emotions. Role Playing – Have your participant act out a time that they had felt that emotion. Use this to make connections between thoughts and actions. Recognize others’ emotions – Have your participant/s tell a story about a time where they had experienced someone expressing this emotion. Then, debrief by asking questions. Why do you believe they felt this? Journaling – Have your participant/s pick a Fetch the Feeling Card and write about when they had experienced this emotion—once again, have them write about how they had expressed this emotion, what had caused this emotion, and what action they had taken due to this emotion.